Set "Looking Out" par Mirake. "Looking Out" set by Mirake. lampe, coupe à fruits, rideaux, deux tableaux, tapis, et papier peint. 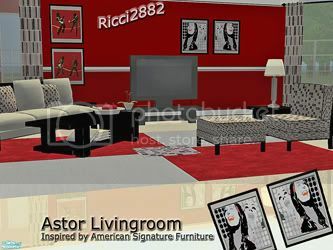 "Astor" living room by RICCI2882. lamp, fruits bowl, curtains, two paintings, rug, and wallpaper. Avec canapé, fauteuil, tables basse et de chevet, et rideaux. 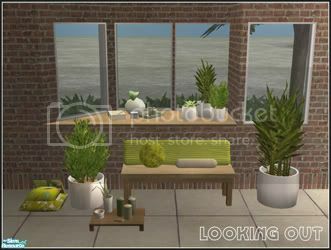 "Cozy" living room by Crissie0721. With sofa, armchair, coffee and end tables, and curtains. Distributeur de sucreries décoratif par Wideopeneyes. 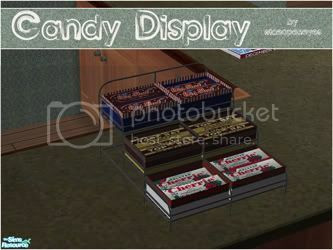 Decorative candy display rack by Wideopeneyes. Jouet girafe et registre d'hôtel par Thayet. 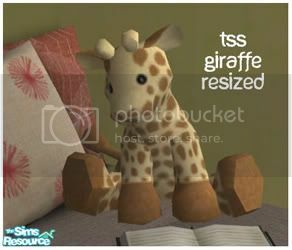 Giraffe toy and reception book by Thayet.